DIRECTIONS: make homemade black beans or any beans of your choice or use canned beans. Mince by hand or in a food processor mix the onion and garlic and add to a small saucepan along with 2C broth or water, 1C rice, cumin, oregano, and chipotle or chili pepper powder. Bring to a boil, cover, reduce heat and simmer for 45 minutes or until rice is cooked. Mix beans and rice in a bowl and set aside. If using sprouted corn tortillas, heat a cast iron skillet and warm the tortillas on each side for a minute or two. If using collard greens, wash well, then pat dry. Add about one-fourth of a cup of the bean and rice mixture down the center of the corn tortilla or collard green. Top with Fiesta Coleslaw and/or toppings of your choice and fold corn tortilla or collard green in half over the mixture. 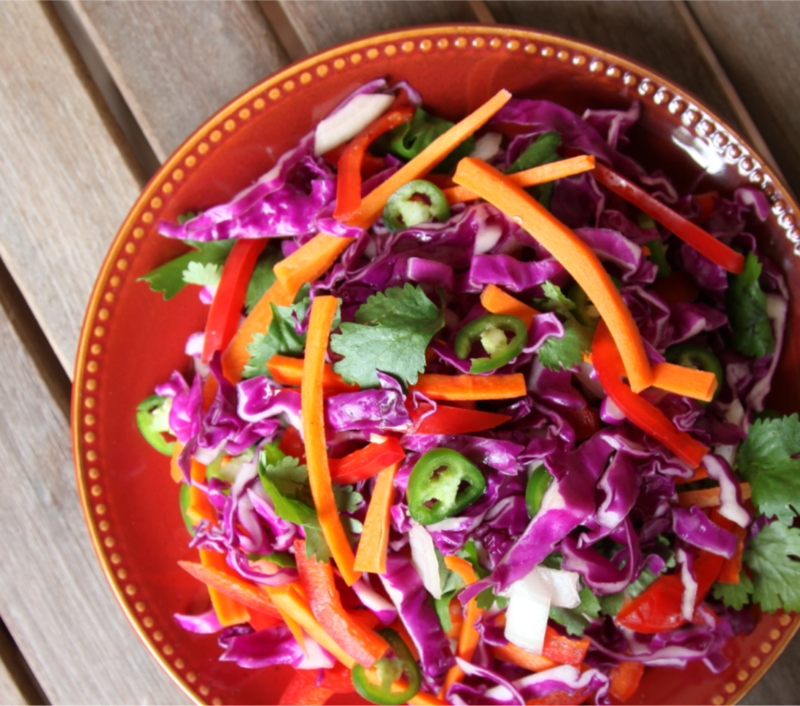 You can use toppings of your choice and serve the slaw on the side. FIESTA COLESLAW: in the meantime, in a large bowl mix the shredded or thinly sliced cabbage, thinly sliced red bell pepper and carrot strips, diced onion, cilantro leaves, and sliced peppers. In a small bowl whisk together the fresh squeezed lime juice, coconut or olive oil, salt, and pepper. Pour over coleslaw vegetables and mix well. For best flavor, let the coleslaw “marinate” for 20-30 minutes, stirring frequently. 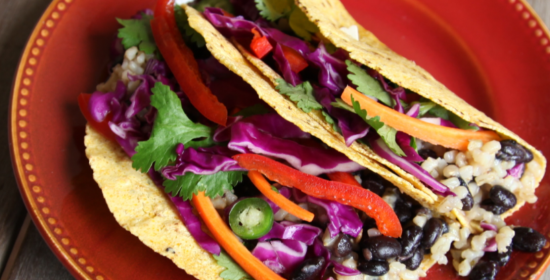 Serve the Fiesta Coleslaw on top of the tacos or use your favorite toppings on the tacos and serve the slaw on the side.